As a postdoc (University of Alaska Fairbanks), I continued to work with interactions in volcanic environments, but this time in a geomorphological framework. I was hired to assist with the set up and maintenance of the UAF Stereophotogrammetry Lab housed in the Remote Sensing group of the Geophysical Institute (GI). Tasks in this position included the initialization and maintenance of the ©BAE SOCET SET/GXP software, developing best practices for test sites in Alaska, and completing relevant research in Alaska and on other planets, mainly Mars. The products of this work include digital terrain models (DTMs) generated with stereophotogrammetry techniques. My primary research project is studying lava–ground/ice interactions on Mars and in Alaska. 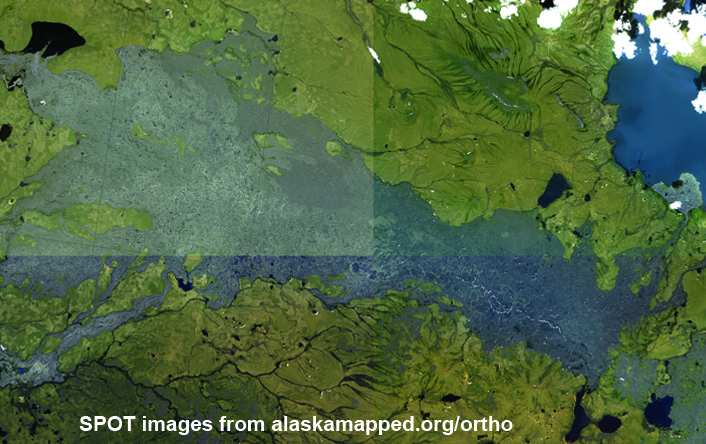 Alaska is one place on Earth that has volcanic activity concurrent with snow/ice. Specifically the Lost Jim Lava Flow in the Bering Land Bridge National Preserve (Seward Peninsula, AK) is unique because the lava flow was emplaced over ice-bearing permafrost terrain. 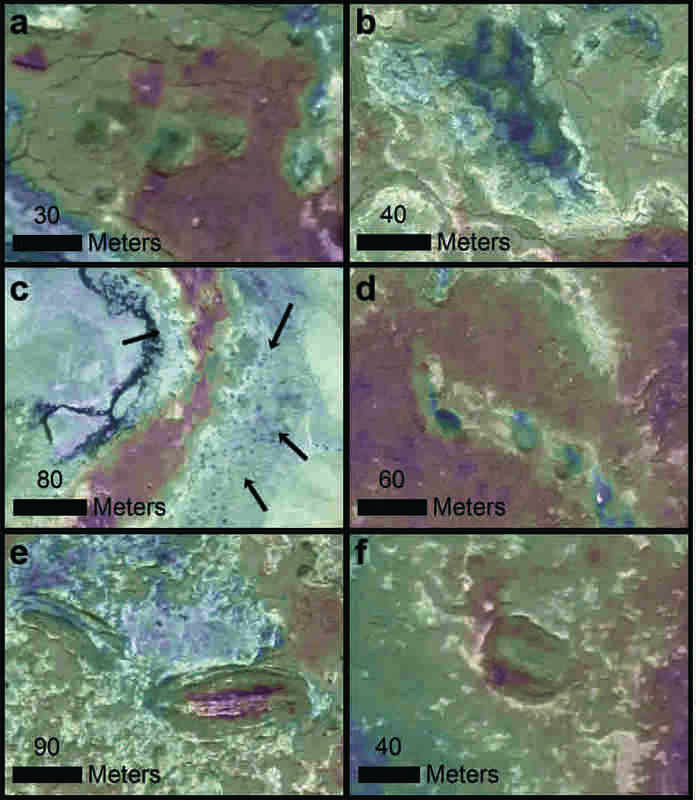 A proposed result of this interaction is the thermokarstification of the lava, in other word subsidence or collapse of lava to forms depressions similar to thaw sinks/lakes seen in the tundra due to melting of permafrost. This type of reaction could also have taken place on Mars were geologically recent volcanism occurred as the planet cooled and ground ice formed. From the DTMs, I have generated of Lost Jim, I can geomorphically and topographically study the flow features. Being able to identify terrains and features related to lava-induced melting of ground-ice provides insight into the paleo-environmental conditions of the region at the time of emplacement, which can further be extrapolated to understand lava–ground-ice interactions on Mars. During my time at the GI, I have trained users on our system and mentored several undergraduate students on independent projects utilizing the software. Features on Lost Jim Lava Flow. (a-c) Forms of depressions, (d) lava tube 'skylights', (e-f) tumuli or shatter rings. Collapse terrains occur in the Tartarus Colles region of Mars. Depressions on Mars tend to be bigger and clustered, but may still represent lava-ice interactions. Difference could be the results of ground ice concentrations, insulating ground covers, or lava emplacement mechanisms. Marcucci, E.C., C.W. Hamilton, and R.R. Herrick (2017) Lava–Ground-Ice Interactions Associated with the Lost Jim Lava Flow, Seward Peninsula, AK, 48th Lunar and Planetary Science Conference, Houston, TX, Abstract #1518, March 2017.